Give your skin a good night’s rest. Nylon Magazine in the U.S recently featured products to help improve your complexion while you sleep and Retriderm Serum was one of them. Click here to find out why you should use Retinol at night. BACKGROUND: Photoaged skin is characterized by a variety of clinical, histologic, and biochemical features. OBJECTIVE: To determine the efficacy of a new topical formulation of 1% retinol and the effects of this same formulation using a 0.5% retinol concentration to minimize irritation. 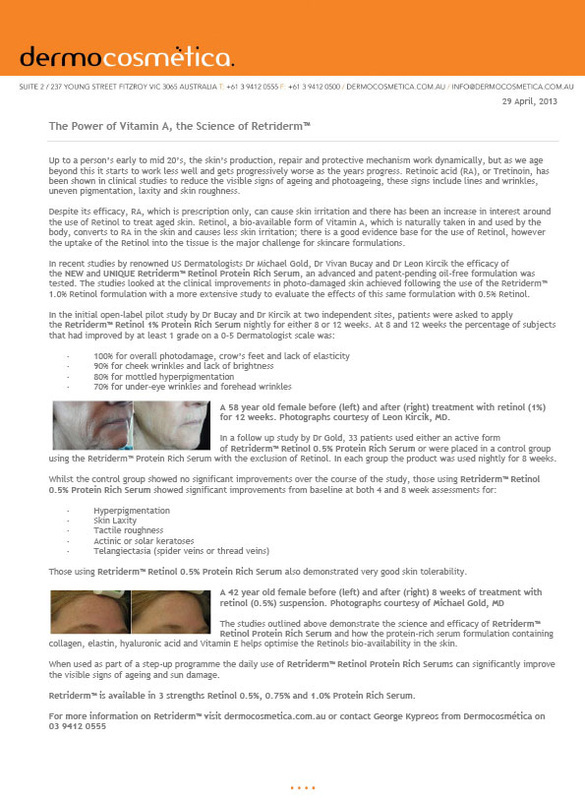 METHODS: Patients at 2 sites (n=6, n=5) with photodamaged skin applied a novel suspension of retinol (1%) daily to their faces for 8 to 12 weeks. Clinicians graded improvement in ultraviolet-induced features at 4 to 6 weeks and at 8 to 12 weeks. Positive results of the observational pilot study warranted a follow-up study on the low concentration. At a third site, females (n=30) with facial photodamage applied the same formulation with or without retinol (0.5%) daily for 8 weeks. Twenty-two subjects applied the test product and 8 applied vehicle according to a randomized, double-blinded, institutional review board–approved protocol. Improvements in photodamage features were graded at 4 and 8 weeks. RESULTS: In the observational pilot study, most participants showed improvement in overall photodamage, crow’s feet, elasticity,wrinkles, brightness, and hyperpigmentation at 60 to 80 days. Improvements at 60 to 80 days were greater than at 30 to 46 days. In the low-concentration study with 0.5% retinol, improvements were modest, most likely due to the lower retinol concentration. Burning, pruritus, dryness, and erythema were minimal with the 0.5% retinol concentration. CONCLUSIONS: The topical formulation of 1% retinol improves photodamaged skin for at least 8 to 12 weeks. Although improvements with the 0.5% retinol were more modest, side effects such as burning, dryness, pruritus, and erythema during the 8-week study period were minimal. These encouraging results justify a longer-term study to determine whether topically applied 0.5% retinol can provide benefits comparable with those seen with topically applied 1% retinol.